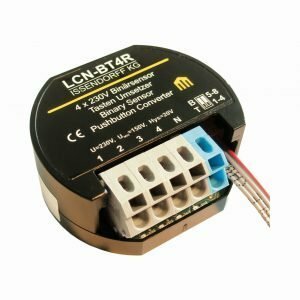 LCN-BT4R is either used as a four-way binary sensor or key signal converter for mains voltage (230 V AC) for all LCN modules from version 17 (2013). The four inputs of the LCN-BT4R evaluate any phase position signals from N to. In its role as key converter conventional buttons can be evaluated. As a binary sensor can for example timer or window contacts (occupancy sensors) be evaluated. The inputs are galvanically isolated from the I-port. In its function as key converter the commands short, long and loose are triggered in the A-table, in its function as binary sensor the commands long and loose are triggered in the B-table.